Professional teeth whitening is a popular method for improving the appearance of the teeth that show when you smile. This is a non-invasive, affordable option that teens and adults can both benefit from. At our office, we prefer the KöR Teeth Whitening system -- it is customizable and reduces tooth sensitivity for the best, most comfortable whitening you could imagine. Keep reading to learn more about your options with KöR and which one may be best for you! The great thing about the KöR system is that it allows us to make personalized treatment plans on a patient-by-patient basis. There is no one-size-fits-all in dentistry, and KöR allows us to account for a variety of whitening needs. From minor discoloration to significant stains resulting from old age or even tetracycline, this system can help in a variety of cases. Home: A 2-week treatment that you can complete from the comfort of your home. 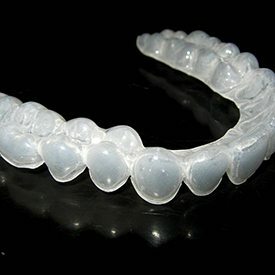 Customized dental trays are filled with high-powered bleaching gel and worn for a specific period of time for 2 weeks. Max: A 2-week treatment at home followed by one in-office whitening treatment. This is the most popular KöR option. Ultra: For situations like fluorosis, geriatric staining, and other more difficult cases, the Ultra treatment includes a jumpstart in-office treatment, a 3- to 4-week at-home treatment, followed by one final in-office application. Ultra-T: Tetracycline stains are among the most stubborn to treat. With Ultra-T, patients have a jumpstart treatment in-office, a 6- to 8-week at-home system, followed by one final in-office application. Professional teeth whitening offers a number of advantages -- especially compared to the one-size-fits-all options you can pick up at the grocery store or pharmacy. After your whitening treatment is complete, maintaining excellent oral hygiene and visiting your dentist regularly for routine checkups and cleanings will be of vital importance. Try to stay away from too much of what causes teeth to change their color, like black coffee, red wine, and other highly pigmented foods and beverages. 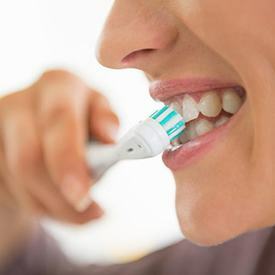 But, we know you won’t want to give these items up completely, so get in the habit of rinsing your mouth out with water or brushing your teeth soon after. It’s a small habit that can go far in helping you maintain your dazzling smile! If you would like to learn more about KöR Whitening or how you can get started on your most youthful grin, we can’t wait to discuss your options! Go ahead and contact your Mesquite dentist, Dr. Byron McKnight, to schedule a cosmetic dentistry consultation.